It is sometimes desirable to play video files in a Xamarin.Forms application. This series of articles discusses how to write custom renderers for iOS, Android, and the Universal Windows Platform (UWP) for a Xamarin.Forms class named VideoPlayer. In the VideoPlayerDemos sample, all the files that implement and support VideoPlayer are in folders named FormsVideoLibrary and identified with the namespace FormsVideoLibrary or namespaces that begin FormsVideoLibrary. This organization and naming should make it easy to copy the video player files into your own Xamarin.Forms solution. Of course, you can turn the phone sideways for a larger view. A more sophisticated video player would have some additional features, such as volume control, a mechanism to interrupt the video when a telephone call comes through, and a way of keeping the screen active during playback. Each platform requires a VideoPlayerRenderer class that creates and maintains a video player control supported by the platform. This article shows the structure of the renderer classes, and how the players are created. Probably the most common source of videos for a video player is the Internet. This article describes how a Web video can be referenced and used as a source for the video player. 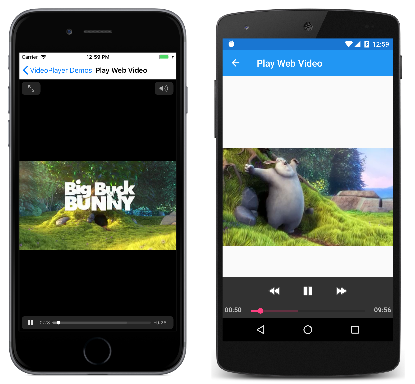 This article uses a ListView to present a collection of videos to play. One program shows how the code-behind file can set the video source of the video player, but a second program shows how you can use data binding between the ListView and the video player. Videos can be embedded as resources in the platform projects. This article shows how to store those resources and later load them into the program to be played by the video player. When a video is created using the device's camera, the video file is stored in the device's image library. This article shows how to access the device's image picker to select the video, and then play it using the video player. Although the video players on each platform provide their own transport controls in the form of buttons for Play and Pause, you can suppress the display of those buttons and supply your own. This article shows you how. Each of the platform video players has a position bar that shows the progress of the video and allows you to skip ahead or back to a particular position. This article demonstrates how you can replace that position bar with a custom control.